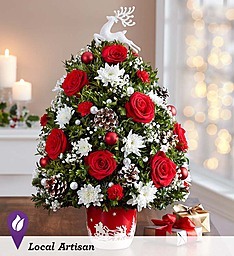 For Christmas 2017, Prange's Florist is pleased to introduce a keepsake version of our customer favorite Holiday Flower Tree! The crisp and cheerful tree is adorned with red ornament balls and frosted pinecones, strung with cream-colored pearls, and topped with a glittering reindeer in flight. 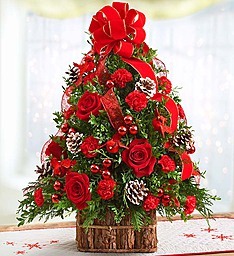 The tree rises from our charming, nostalgic ceramic container depicting Santa’s ride through a rustic village on a starry Christmas Eve. 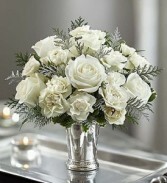 As Flowers Small, Medium And Extra Large, Large Arrangement Measures Approximately H X L, Medium Arrangement Measures Approximately H X L, Small Arrangement Is Made Of Boxwood And Gypsophila Only And Measures Approximately H X L.
Basket, Block Oasis, Assorted Christmas Greens, Peppermint Carnations, Red Mini Carnations, White Chrysanthemums, White Montecasino, Berry Clusters Artificial, Pine Cones, Gold, Red And Green Bow With Streamers. White Disbud Mum Football, Cremon, Fuji, Red Rose, White Button Or Cushion, Red Hypericum Or Green, Gypsophila Or Limonium, Eucalyptus Seeded Or Silver Dollar, Assorted Christmas Greens, Casserole Dish Codified No Sub, Block Foam, Pine Cone Pick, Floral Pick, Mm Silver Ball. Design Tray, Hurricane, White Candle, Candle Holder Pick, Mm Gold Balls, Mm Gold Balls, Sheer Gold Loop & Tail ( ), White Roses, Burgundy Mini Carnations, ( Dianthus If Available Use In Med & Large Instead Of Mini Carns), Variegated Pittosporum, Assorted Seasonal Greens. 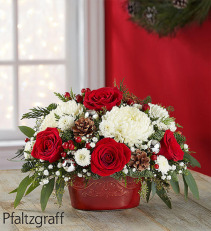 Inspired by our best selling holiday arrangement, this striking and luxurious centerpiece is artfully crafted from soft white roses, deep burgundy miniature carnations, and accented with fragrant Christmas greens, golden ornaments and ribbon. 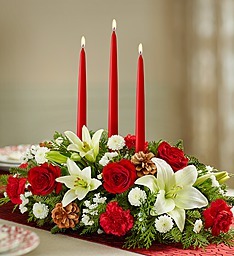 A glass hurricane vase and tapered candle complete this seasonal design, sure to cast a warm, cozy glow wherever it’s displayed. 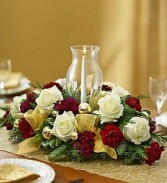 Perfect for a dining table, sideboard, or other place where family and friends will gather. 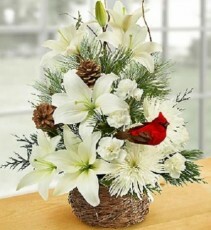 14" or 18" or 22" centerpiece. 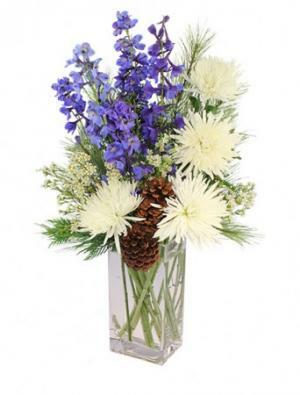 Larger pieces designed to your specifications: Call Prange's Today 352-335-0100. Fresh And Festive Arrangement Of Red Roses, White Lilies, Alstroemeria, Mini Carnations, Hypericum And Mixed Christmas Greens, Handdesigned By Our Florists In A Stylish Clear Glass Gathering Vase Tied With Satin Ribbon Vase Measures H, Large Arrangement Measures Approximately H X L, Medium Arrangement Measures Approximately H X L, Small Arrangement Does Not Include Lilies Or Hypericum And Measures Approximately H X L, Our Florists Handdesign Each Arrangement, So Colors, Varieties, And Container May Vary Due To Local Availability, Lilies May Arrive In Bud Form And Will Open To Full Beauty Over The Next Days. 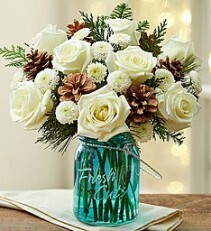 We've decked out our best selling bouquet in its holiday best. 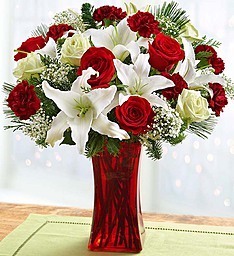 Inspired by California style, our expert florists gather festive red roses, white lilies, alstroemeria, mini carnations and fragrant assorted greens in a stylish glass gathering vase, accented by a red ribbon. The brilliance of winter in a classic arrangement of red, white, green and gold! 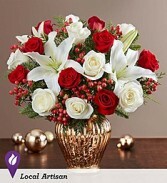 This elegantly festive mix of roses, lilies and more arrives in our luxurious bronze urn vase with a distressed mercury finish. 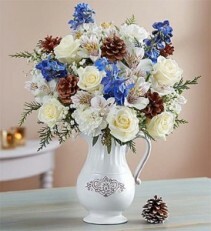 Like winter itself, this gift is a wonderland! 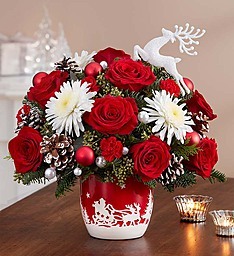 Our enchanting bouquet of red and green roses, crisp white lilies, burgundy carnations and evergreens delivers all the magic and wonder of winter! 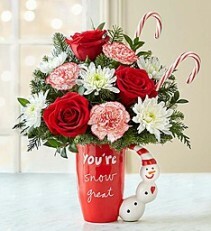 Hand-designed by our expert florists in a vibrant ruby red gathering vase, we guarantee it will leave all the special people in your life feeling warm and loved! 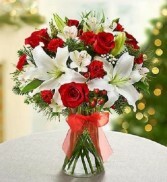 Red Square Top Cinch Vase Or Similar, Red Roses, Green Or White Roses, Asiatic White Lilies, Bunch Gypsophila, Mixed Seasonal Greens. 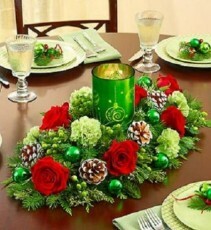 Centerpiece Arrangement Of Roses, Carnations, Hypericum And Assorted Christmas Greens, Accented With Pinecone Picks And Ornament Balls, Features A Shimmering, Keepsake Green And Silver Ornament Votive In The Center Measures H X W, Includes Tea Light Candle For The Votive, Large Arrangement Measures Approximately H X L, Medium Arrangement Measures Approximately H X L, Small Arrangement Measures Approximately H X L, Our Florists Select The Freshest Flowers Available So Colors And Varieties May Vary. 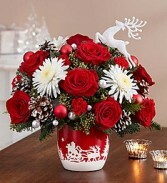 A highlight of our exclusive keepsake “Santa’s Sleigh Ride”™ collection is this new festive and fun floral arrangement of red roses and carnations, white cremones, fragrant greenery and more, accented with red ornament balls and frosted pinecones, strung with cream-colored pearls, and topped with a glittering reindeer in flight. 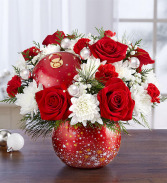 The arrangement is artfully designed in our charming, nostalgic ceramic container depicting Santa’s ride through a rustic village on a starry Christmas Eve. It’s a novel and truly original holiday gift! 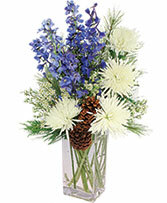 As Flowers For Medium, Split The Additions From To In Book. 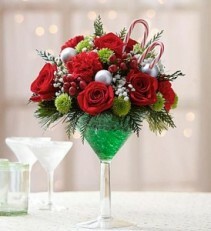 Santa Paws Adogable Arrangement Crafted With Fresh White Carnations, Red Mini Carnations And Assorted Christmas Greens, Comes With Eyes, Nose And A Stylish Red Ribbon Collar, As Well As A Traditional Santa Hat And Glasses Measures H X L, Santas Best Reindeer Crafted From Fresh White Carnations, Red Mini Carnations And Assorted Christmas Greens, Accented With Eyes, A Red Nose, An Adogable Name Tag And Adorable Felt Antlers Measures H X L, Both Arrangements Artistically Designed By Our Select Florists In A Willow Dog Bed Lined With Sheet Moss Measures W X D X H, Our Florists Select The Freshest Flowers Available So Floral Colors And Varieties May Vary, Make Their Gift Twice As Festive With Both Pups:, Santa Paws And His Best Reindeer Features Both Holiday Adogable Arrangements, Accented With Poms, Assorted Christmas Greens And Pinecone Picks, Designed In A L Splitwood Handled Basket Arrangement Measures Approximately H X L, Our Florists Select The Freshest Flowers Available So Colors And Varieties May Vary. Our holiday hound-shaped a-DOG-able® arrangement is coming to town, ready to deliver smiles! 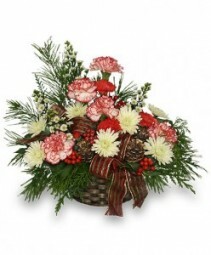 Hand-arranged from fresh carnations and fragrant greens inside a willow dog bed, he's decked in a Santa hat and glasses and accented with festive ornaments. 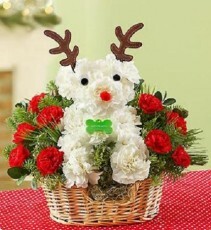 Pair him with our Santa's Best Reindeer™ arrangement and guide your special someone to a truly original Christmas. 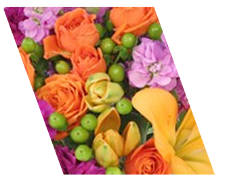 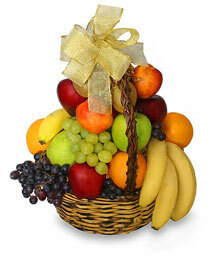 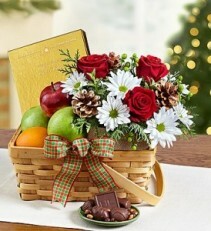 Flowers Book, Oranges, Red Apples, Green Apples, Cube With Red Roses, White Daisies, Christmas Foliage And Cones, Large Box Chocolates. Share the bounty of the season with our basket of country style delights! 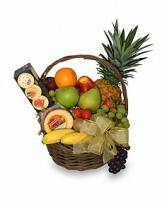 This wooden handled basket features our Winter arrangement bundled with crisp, orchard-fresh apples and oranges and a box of delicious chocolates. Topped off with a festive ribbon, it's an extra special gift that is sure to please!